We made a new mini-zine for tomorrow’s workshop at OCPL’s downtown MakerSpace. Come, get one, and learn how to assemble it! We’ll be at the Everson tonight to and joining several other local arts and culture orgnaization to talk about our work. 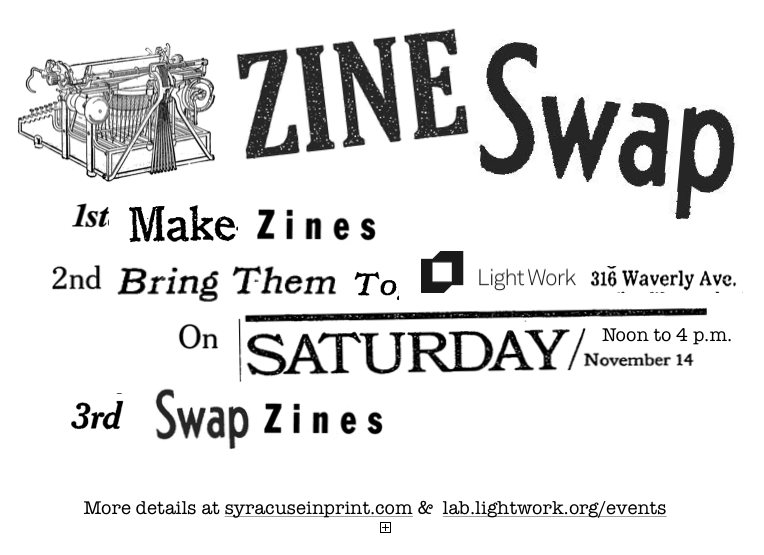 We’ll be there to share news about our upcoming Zine Swap and introduce folks to zines. Come and browse our zine library, pick up a free button, and take home a mini-zine about making zines — then stay for the best movie of the year, projected on the side of the museum! More info on the event can be found at the Urban Video Project.